Roman Catholic majority followed by Protestant, Atheism, Deism, Agnosticism, and Irreligion. Minorities: Native people are mainly animist, some from Middle East who are nationalized Colombian citizens are Muslims or Druze. Colombians (colombianos in Spanish) are citizens of Colombia. A Colombian can also be a person born abroad to a Colombian parent or legal guardian as well as a person who acquired Colombian citizenship. Colombia is a multiethnic society, home to people of various ethnic, religious and national origins. As a result, majority of Colombians do not equate their nationality with their ethnicity, usually embracing and espousing both simultaneously. The majority of the Colombian population is made up of Old World immigrants and their descendants. Following the initial period of Spanish conquest and immigration, different waves of immigration and settlement of non-indigenous peoples took place over the course of nearly six centuries and continue today. Elements of indigenous Amerindian and more recent immigrant customs, languages and religions have combined to form the culture of Colombia and thus a modern Colombian identity. In this regard, Colombia and Colombians share many cultural similarities with their South American neighbors: Brazilians, Venezuelans and others. Estimates of the mestizo population in Colombia vary widely, as Colombia's national census does not distinguish between white and mestizo Colombians. According to the 2005 census, the mestizo and white population combined make up approximately 85.9% of the Colombian population, but there is no official estimate of the mestizo population exclusively. Among Colombians, people with mestizo skin tones are sometimes referred to as "trigueños/as”. 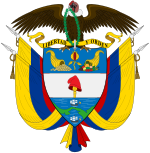 Many Colombians are descended from Lebanon, Jordan, Syria and Palestine, who moved to Colombia to escape the repression of the Turkish Ottoman Empire and/or financial hardships. When they were first processed in Colombia's [ports, they were classified as "Turks". It is estimated that Colombia has a Lebanese population of 700,000 direct descendants and 1,500,000 who have partial ancestry. Most Syrian-Lebanese immigrants established themselves in the Caribbean Region of Colombia in the towns of Santa Marta, Lorica, Fundación, Aracataca, Ayapel, Calamar, Ciénaga, Cereté, Montería and Barranquilla near the basin of the Magdalena River. Many Arab-Colombians adapted their names and surnames to the Spanish language to assimilate more quickly in their communities. Some Colombian surnames of Arab origin include: Guerra (originally Harb), Domínguez (Ñeca), Durán (Doura), Lara (Larach), Cristo (Salibe), among other surnames. The majority of Asian Colombians are descended from China, India, Japan, and Korea. During 1928, Japanese families settled in Valle del Cauca where they came as farmers to grow crops. Then in 1970 to 1980, it was estimated that there were over 6,000 Chinese in the country. Their current communities are found in Bogota, Barranquilla, Cali, Cartagena, Medellin, Santa Marta, Manizales, Cucuta and Pereira. Other Asian groups include Indians, Koreans, and Filipinos are minor but significant. Because of its strategic location Colombia has received several immigration waves during its history. Most of these immigrants have settled in the Caribbean Coast; Barranquilla (the largest city in the Colombian Caribbean Coast) and other Caribbean cities have the largest population of Lebanese, Italian, French, and Gypsy descendants. There are also important communities of American and Chinese descendants in the Caribbean Coast. Most immigrants are Venezuelans, mostly based in Bogotá, Colombia's capital. There are 101 languages listed for Colombia in the Ethnologue database, of which 80 are spoken today as living languages. There are about 500,000 speakers of indigenous languages in Colombia today. After the successful completion of all the basic and middle education years, a high-school diploma is awarded. The high-school graduate is known as a bachiller, because secondary basic school and middle education are traditionally considered together as a unit called bachillerato (sixth to eleventh grade). Students in their final year of middle education take the ICFES test (now renamed Saber 11) in order to gain access to higher education (Educación superior). This higher education includes undergraduate professional studies, technical, technological and intermediate professional education, and post-graduate studies. The National Administrative Department of Statistics (DANE) does not collect religious statistics, and accurate reports are difficult to obtain. However, based on various studies and a survey, about 90% of the population adheres to Christianity, the majority of which (70.9%) are Roman Catholic, while a significant minority (16.7%) adhere to Protestantism (primarily Evangelicalism). Some 4.7% of the population is atheist or agnostic, while 3.5% claim to believe in God but do not follow a specific religion. 1.8% of Colombians adhere to Jehovah's Witnesses and Adventism and less than 1% adhere to other religions, such as Islam, Judaism, Buddhism, Mormonism, Hinduism, Indigenous religions, Hare Krishna movement, Rastafari movement, Orthodox Catholic Church, and spiritual studies. The remaining people either did not respond or replied that they did not know. In addition to the above statistics, 35.9% of Colombians reported that they did not practice their faith actively. ^ "Departmental Administrativo National de Estadística". Dane.gov.co. Retrieved 2017-03-10. ^ "Almost 1 million people moved from Venezuela to Colombia in just two years, study shows". migracioncolombia.gov.co. Retrieved 13 June 2018. ^ INE (2011). "Población nacida en el exterior, por año llegada a Venezuela, según pais de nacimiento, Censo 2011" (PDF). Ine.gob.ve (in Spanish). ^ "Extranjeros en Chile superan el millón 110 mil y el 72% se concentra en dos regiones: Antofagasta y Metropolitana" (in Spanish). El Mercurio. 2018-04-09. ^ Statistics Canada (2011). "2011 National Household Survey: Data tables". 12.statcan.gc.ca. ^ [pdf_varios/estadisticas/Sintesis%20Estadisticas%20Radicaciones%20a%20Diciembre%202014.pdf Estadisticas Radicaciones 2014] Check |archiveurl= value (help) [Residencies 2014] (PDF) (in Spanish). 1. Buenos Aires: Ministry of Internal Affairs of Argentina. 2014. ISBN 978-950-896-420-5. Archived from [pdf_varios/estadisticas/Sintesis%20Estadisticas%20Radicaciones%20a%20Diciembre%202014.pdf the original] Check |url= value (help) (PDF) on |archive-url= requires |archive-date= (help). ^ "Colombiani in Italia. Popolazione residente in Italia proveniente dalla Colombia al 1° gennaio 2017. Dati ISTAT". ^ INEGI (2010). "Conociendo...nos Todos" (PDF) (in Spanish). ^ "Anzahl der Ausländer in Deutschland nach Herkunftsland (Stand: 31. Dezember 2014)". De.statista.com. Retrieved 2017-08-10. ^ "Country of Birth Database" (XLS). Oecd.org. Retrieved 2017-08-10. ^ "Utrikes födda efter födelseland, kön och år: Colombia, 2016" [Foreign born by country of birth, gender and year: Colombia, 2016] (in Swedish). Statistics Sweden. Retrieved 10 August 2017. ^ Department of Social Services (2011). "The Colombia-born Community". ^ a b "COLOMBIA UNA NACIÓN MULTICULTURAL" (PDF). www.dane.gov.co (in Spanish). Retrieved 2018-01-21. ^ EPM (2005). "La etnia Wayuu". Empresas Publicas de Medellin (in Spanish). Archived from the original on 2008-02-19. Retrieved 2008-02-29. ^ "Aumenta El Numero De Inmigrantes Venezolanos En Colombia 017591". Ntn24.com. Retrieved 2017-08-10. ^ "Ministerio de Educación de Colombia, Estructura del sistema educativo". 29 June 2007. Archived from the original on 29 June 2007. ^ "UNESCO Institute for Statistics Colombia Profile". Uis.unesco.org. Retrieved 27 June 2014. ^ Beltrán Cely, William Mauricio. "Del monopolio católico a la explosión pentecostal'" (PDF) (in Spanish). Universidad Nacional de Colombia, Facultad de Ciencias Humanas, Centro de Estudios Sociales (CES), Maestría en Sociología. ISBN 978-958-761-465-7. ^ Beltrán Cely, William Mauricio. "Descripción cuantitativa de la pluralización religiosa en Colombia" (PDF). Universitas humanística 73 (2012): 201–238. – bdigital.unal.edu.co. ^ "Religion in Latin America, Widespread Change in a Historically Catholic Region". Pewforum.org. Pew Research Center. November 13, 2014.